Thomas transmission is an integral part of an automo­bile engine whose piston motion is transferred by a conventional connecting rod to the long arm of the bellcrank lever oscillating about a fixed fulcrum. A horizontal connecting rod, which rotates the crank­shaft, is attached to the short arm of the bellcrank. Crankshaft motion is steadily and continuously maintained by a flywheel. However, no power other than that required to drive auxiliaries is taken from this shaft. 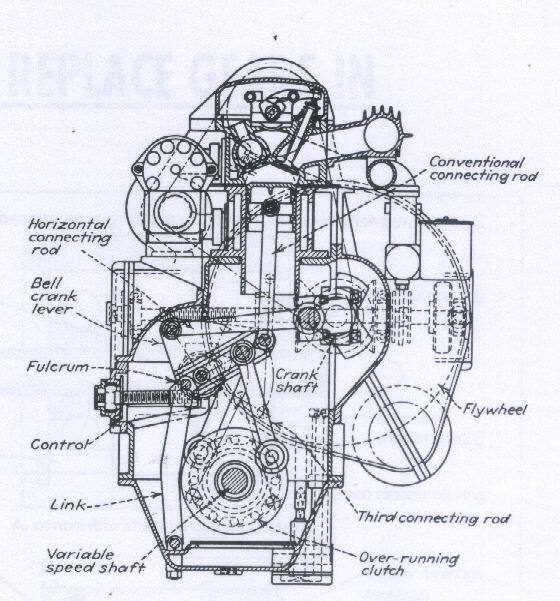 The main power output is transferred from the bellcrank lever to the over-running clutch by a third connecting rod. The speed ratio is changed by sliding the top end of the third connecting rod within the bellcrank lever with a crosshead and guide mechanism. The highest ratio is obtained when the crosshead is farthest from the fulcrum, and movement of the crosshead toward the fulcrum reduces the ratio until a "neutral" position is reached. That occurs when the center line of the connecting rod coincides with the fulcrum.